When I was in college, one of my many jobs was as a live-in nanny. I got room and board, with some minor child care duties, and I got full range of an AMAZING kitchen, stocked full of recipes. 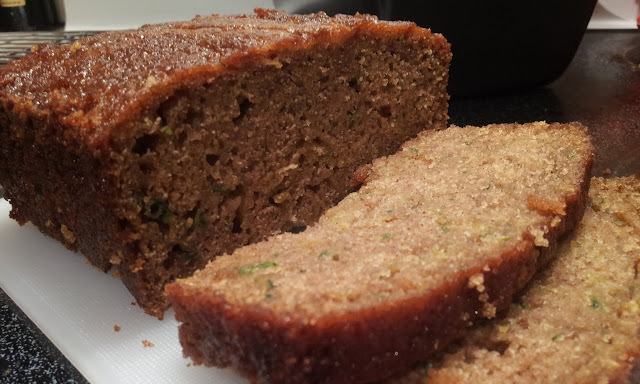 One of the family's favorite things to make was Zucchini Bread, using fresh zucchinis from their garden. When I graduated from college and moved away, my going away present was a copy of all my favorite recipes from their home. The first one in the packet? 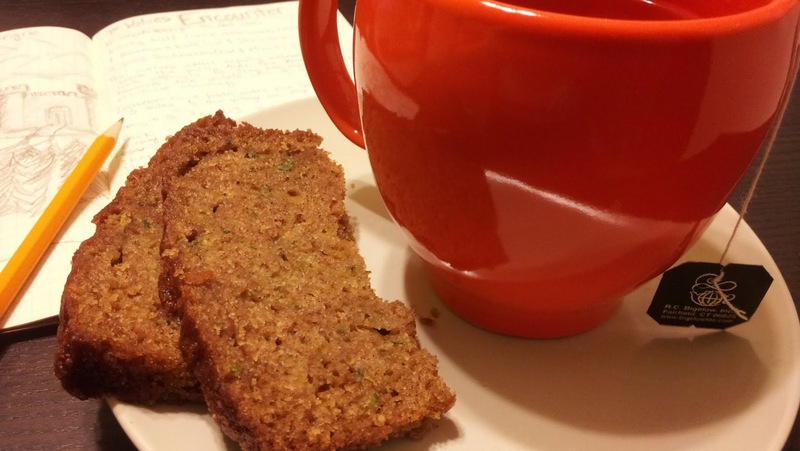 Their zucchini bread. And now, I'm going to share that treasured gift with you. 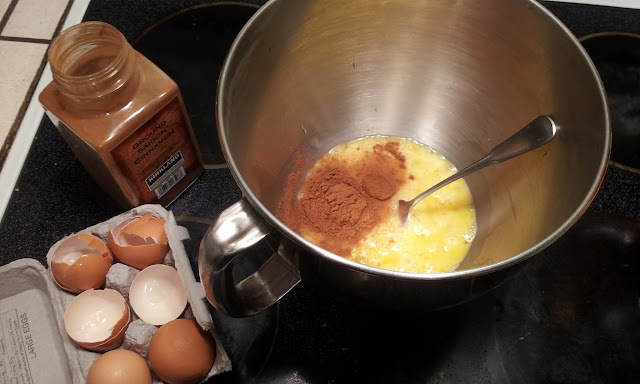 Combine sugar, eggs, vanilla and cinnamon well. Add zucchini to egg mixture. Combine dry ingredients well in a separate bowl. 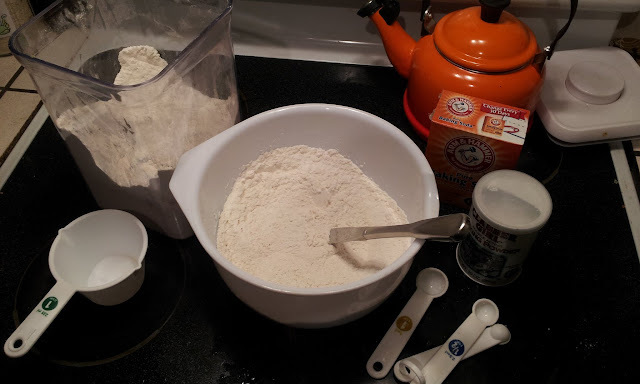 Mix dry ingredients gradually with moist until combined well. Add oil. Use mixer for 1 minute on low, then 1 minute on medium speed. 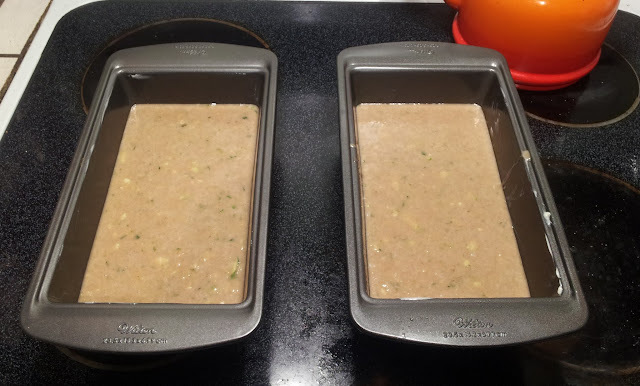 Place equal portions of batter in to 2 greased bread pans. Bake for 1 hour* at 325°F. *May take longer. Check with toothpick – if moist when removed add 10 minutes to cooking time and recheck. When toothpick (or bamboo chopstick in my case) doesn't check moist, remove from oven. Run butter knife around edges of loafs to ensure they don't stick. Let loafs cool for 20-30 minutes. Then remove loafs from pans, slice, and enjoy. I like to have a slice for breakfast or dessert, with or without some coffee or tea. It's good at room temp or re-toasted (with a toaster oven). Store in air-tight container at room temp, will keep for about a week. Women in Engineering is a heated topic where I work. It's not that it's controversial, it's just that's it's something a lot of people feel very strongly about. Everyone wants more women in Engineering and everyone has very strong opinions about how that should happen. I try to normally keep my dog out of that fight, but here's something I think everyone agrees is a good idea. As many of you know, getting girls excited for Engineering young isn't an easy task. Studies have shown that one of the biggest things that effect if/when a girl gets interested in Engineering is when they're exposed to Engineering principles. Sparking interest early is important, and GoldieBlox is the first toy I've seen to try and do this right. It's not just a pink-ified version of boy's building blocks. It's built with a girl's interests in mind. Watch the video, read the articles, and please feel free to support this awesome project, via donations or spreading the word. I'm not associated with GoldieBlox at all, I just happened to stumble upon it and think that it's an AWESOME project that needs our support! I'm chipping in to get a set for my niece, even though she'll have a few years before she gets to play with it. Here's to hoping there will be more GoldieBlox sets to purchase when she's old enough to use them. I've recently starting DMing for a Dungeons and Dragons campaign (if you didn't already know I'm a massive nerd, surprise!). I'm sure eventually I'll write a few posts outlining my adventures as a new DM.. But! For right now, let's focus on the dice. 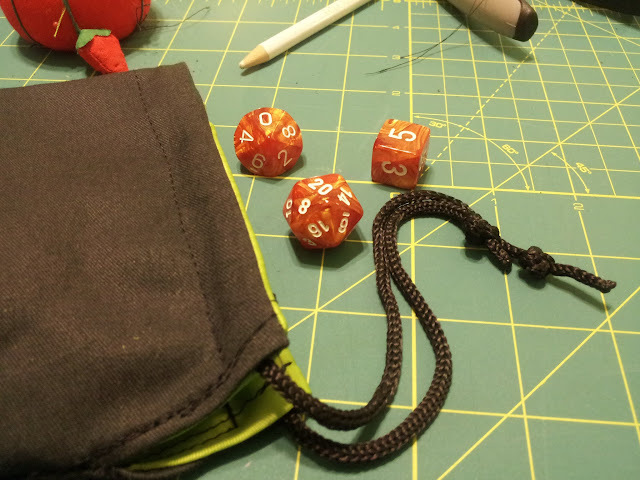 I needed more dice to DM with. 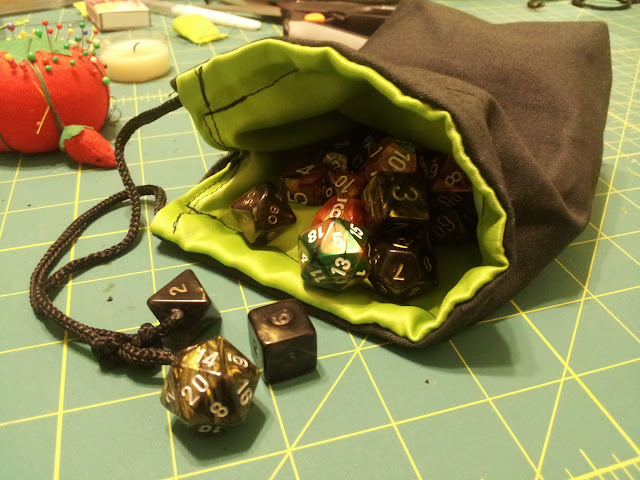 And thus, I needed a new dice bag. So, here we go..
You don't need a lot of fabric, just a 8x12 inch rectangle from both your liner and your outside fabric. 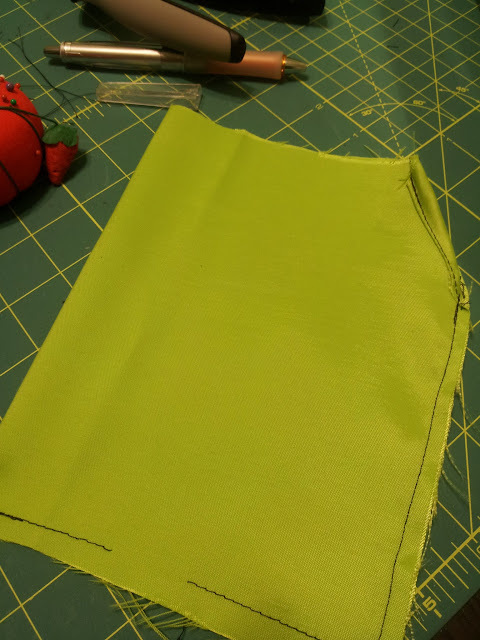 I cut my fabric on the fold, so I just needed to measure 8x6 pieces. 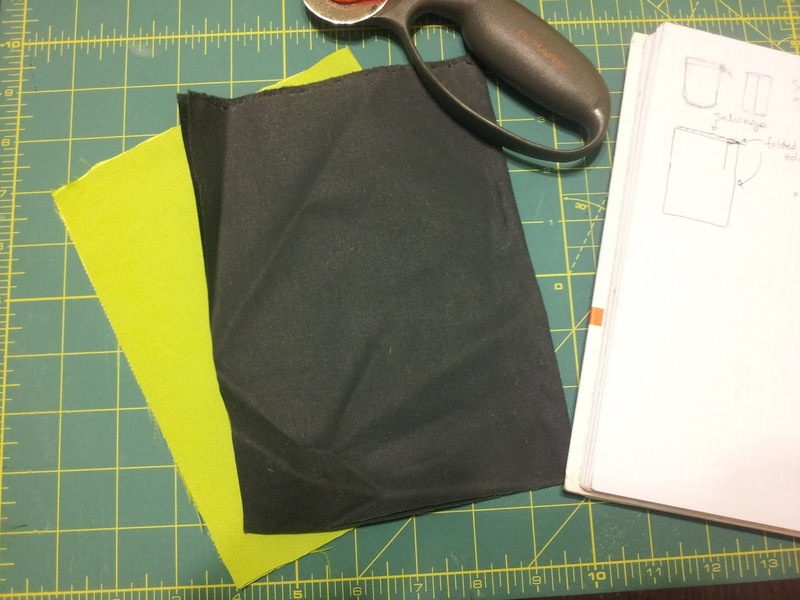 Fold your two rectangles so that they're each 8x6 inches, with the fold on the left. 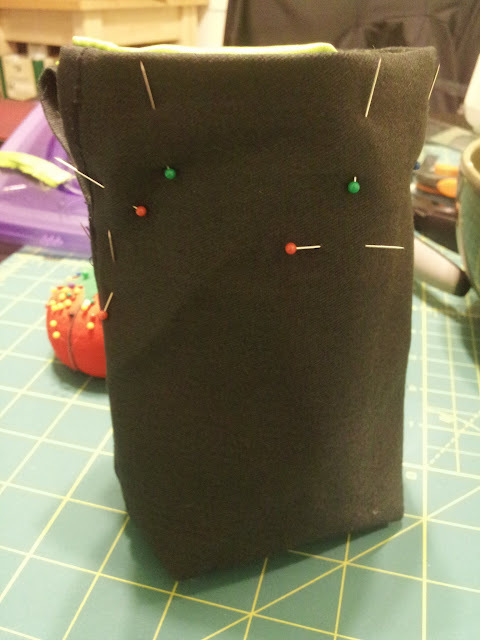 Then, pin the right and bottom edges of each piece of fabric. Measure two inches from the top edge and put a little mark with your fabric pen. Unpin right side until the mark. Then, fold the fabric to create a triangle hem along the top 2 inches of the right side, like so. This is with one edge done. Make sure you do both edges! 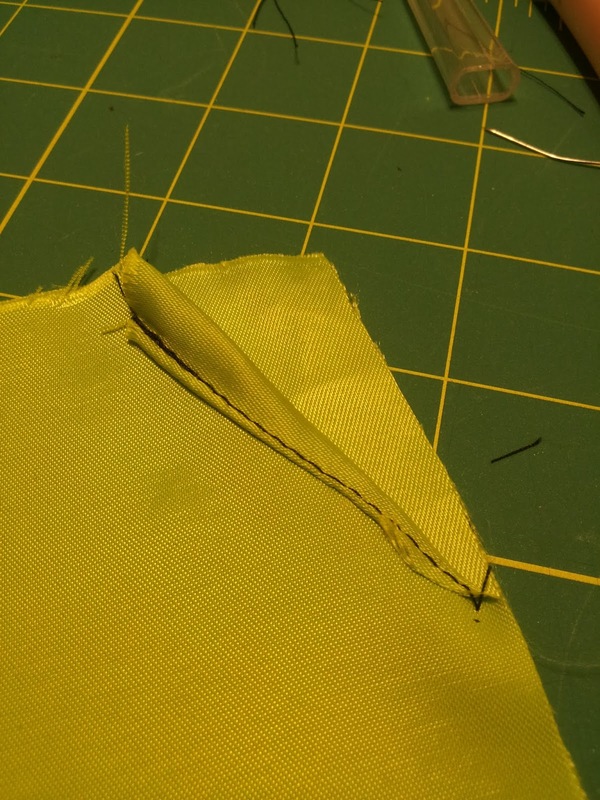 Once you've got the top right corners hemmed, sew along the right and bottom edges, with a 1/4 inch seam allowance for both the liner and outside fabrics separately. Ignore the gap at the bottom, I was trying something..
You should have two "pockets" now. Let's turn them into "pouches" by making the bottoms flat. To make the bottom flat, we're going to box the corners. You're going to do this step four times, once for each corner of the bag. Go ahead and start with one of the liner corners. Pull the two layers of the liner apart and then align the bottom seam with the side seam. 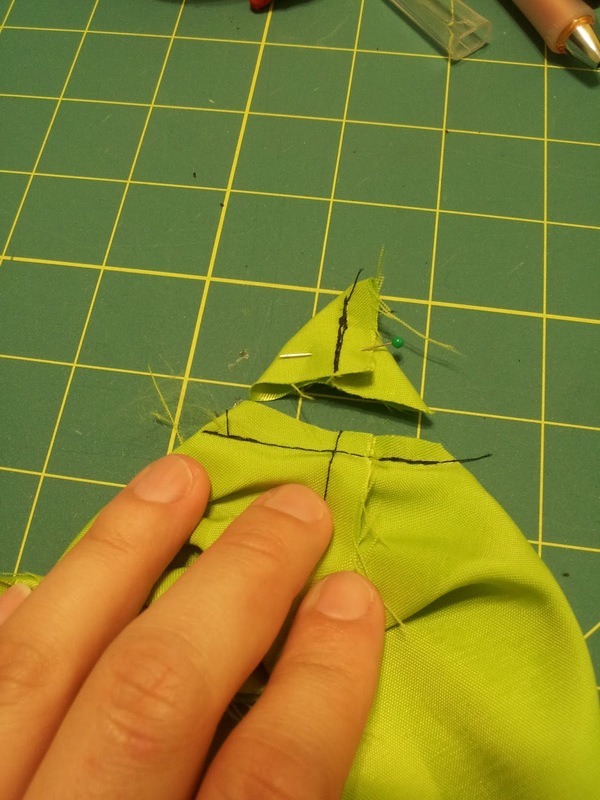 Press the seams together so that you get a triangle, where the seam is in the center. You don't need to press the whole bag, just a few inches worth. 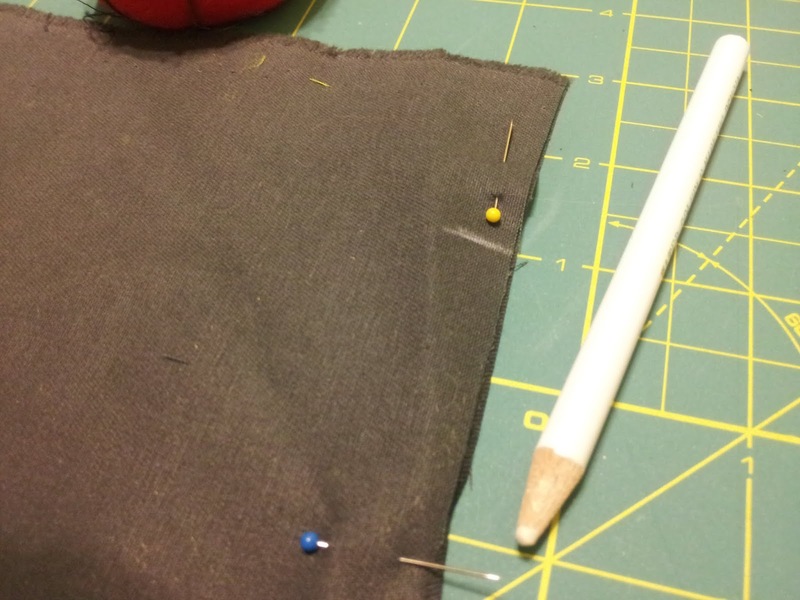 Once you have the corner nice and flat, take a ruler and place it perpendicular to the seam. 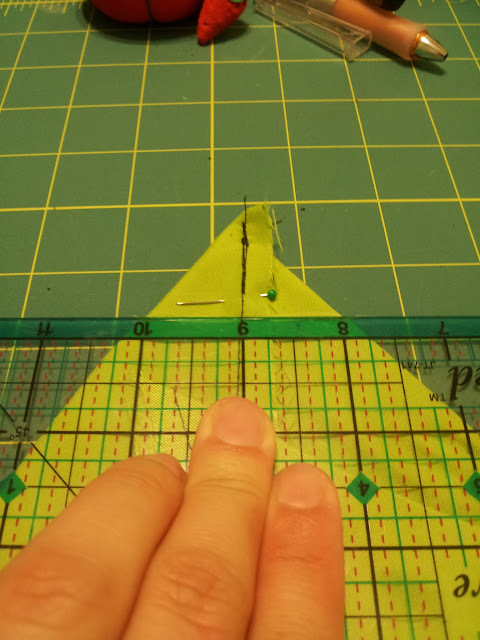 Position the ruler so that it forms a triangle on the corner, with the base of the triangle measuring 2". See the image above for what I mean. 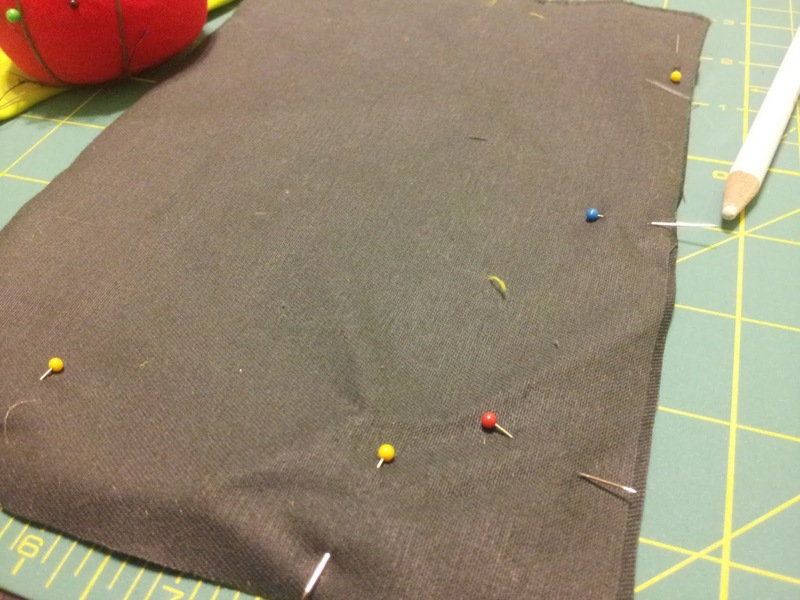 Mark the line, pin it, and then sew along the line. 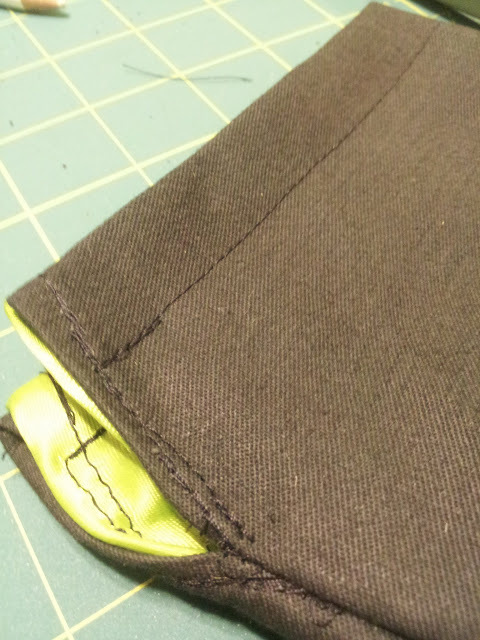 Trim the corner off, leaving a 1/4" seam allowance. 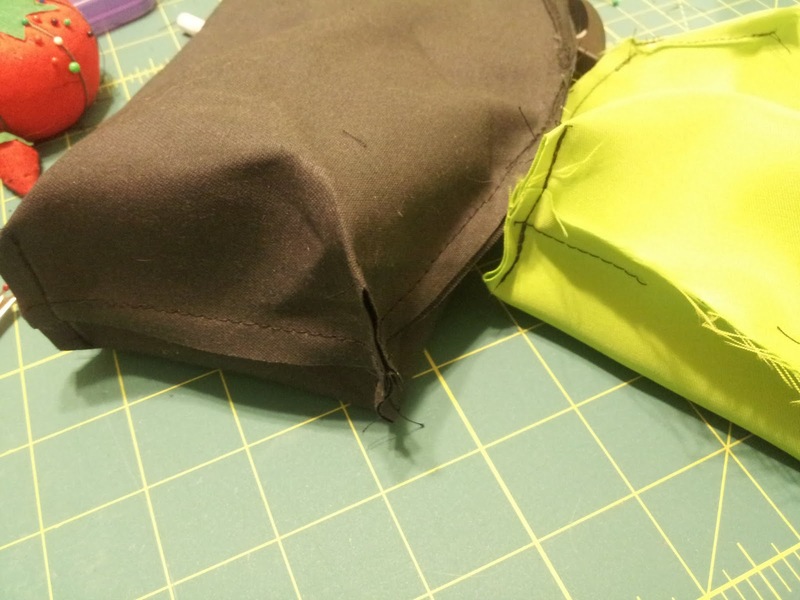 Once you do all four corners, you should have two little pouches that have flat bottoms and can stand up rather well on their own. Attach the Liner to the Outside! 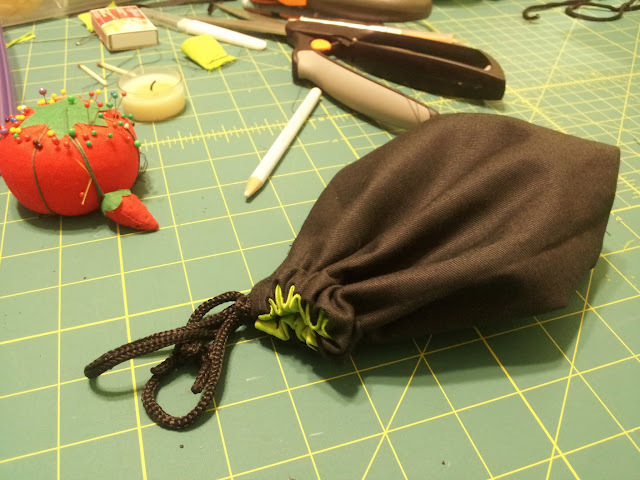 Once you've got the two pouches made separately, it's time to put them together. 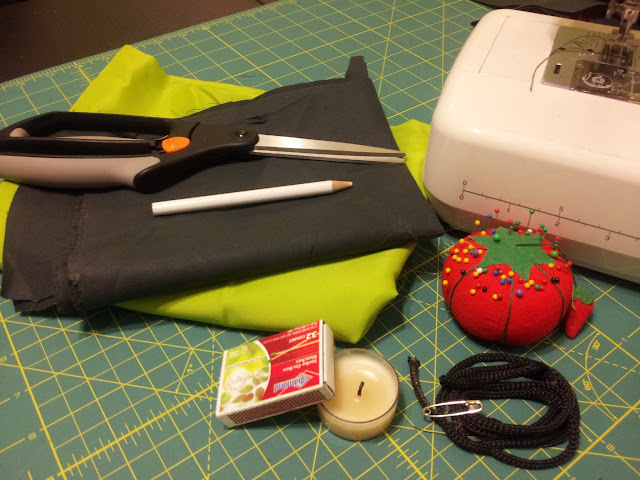 Turn the outside fabric pouch inside out and put it inside the liner. Their "right-sides" should be facing each other. 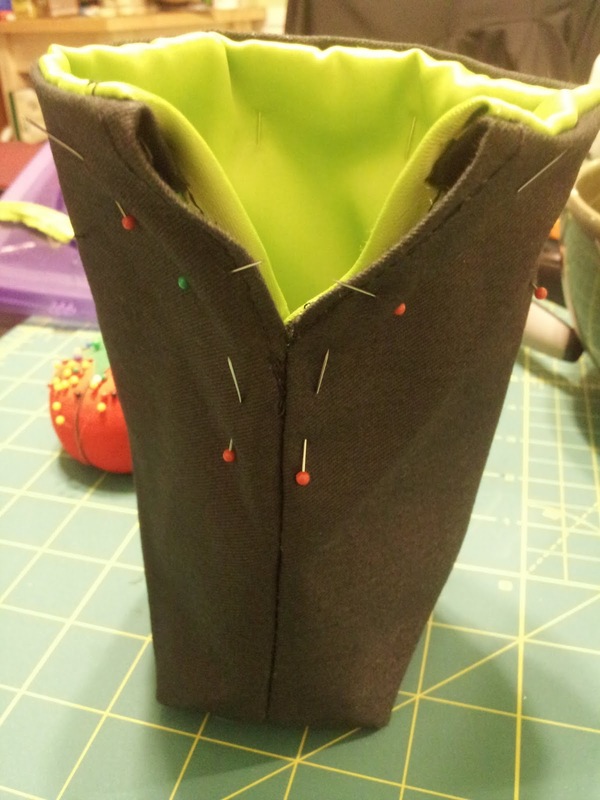 Pin the top edges together and sew, carefully, around. Don't sew down the sides! The hemmed edges should NOT be sewn together!! You only should sew along the TOP edge, with a 1/4 inch seam allowance. 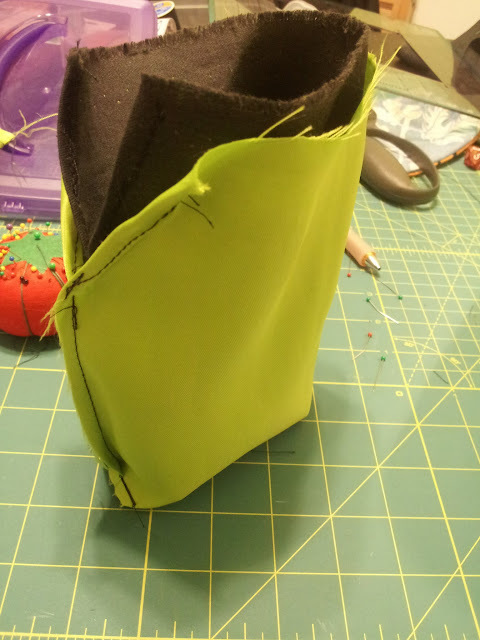 Once you've done that, you should be able to flip the outside fabric bag right side out, through the hole, with the linear going inside. The top edge should be nice and finished. Press the seam with an iron, if you feel the need. This is the trickest part. You're going to top stitch up one of the open sides, around the top edge leaving a 3/4 inch channel for the cord to pass through, and then back down the other side edge. You want to pin the heck out of your bag to make sure the liner doesn't slip around too much. 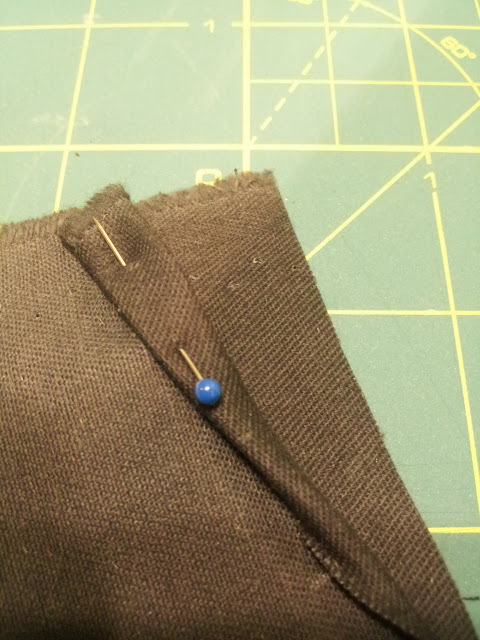 When you've done this last stitch, your bag's top edge and side seams should like like below. Notice the double stitching on the sides? 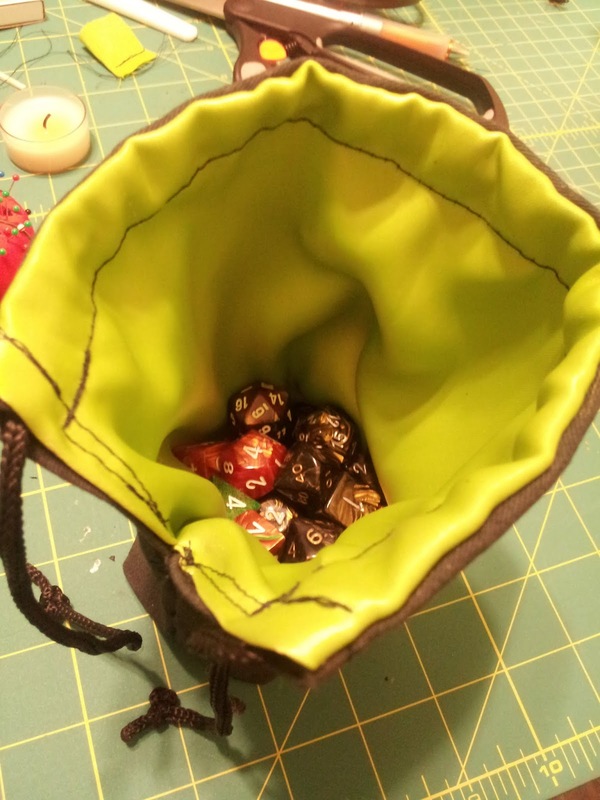 One set is from the original hems, the other is from finishing the bag. 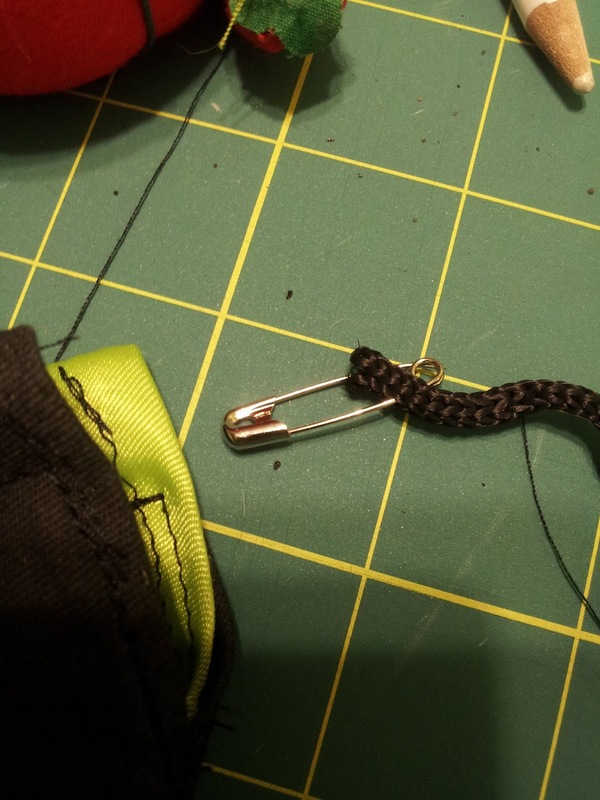 Take your bit of cord and pin a safety pin to one end. Slip the safety pin into one of the open ends of your cord channel and work it all the way through. It should pull the cord through with it, easily enough. Once you've got the cord all the way through, trim it to the length you want and melt the tips to keep them from fraying. 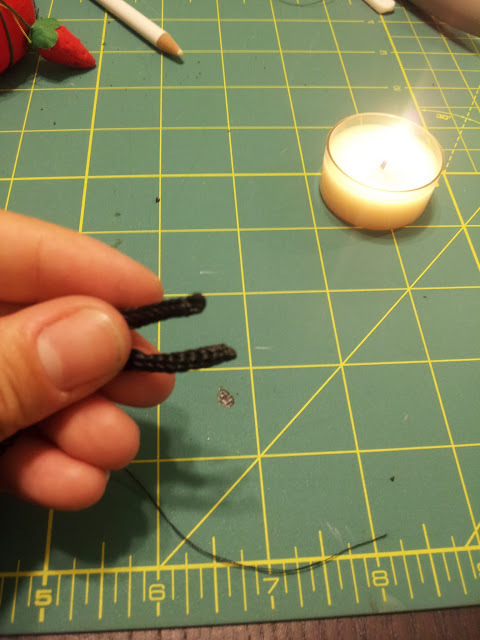 Then, tie double knots on each end of the cord and BAM! You're done. Three sets and there's still plenty of room. Cinch and tie... Go forth and slay dragons. Giant Version of a Stacking Game Rhyming with "In-ga"
This was the summer of camping and BBQ's for my friends and I. We spent a decent amount of time outside, working on our tans and trying not to get eaten alive by the various bugs and beasts. And of course, I had to figure out a way to bring games into the equation. Enter Giant.. um.. Stacking Tower Game. 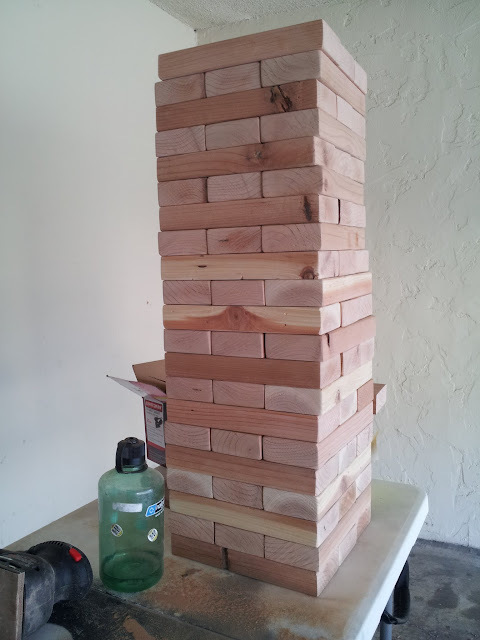 The Instructables guide for the giant 2x4 tower game is rather straight forward, but I figured I'd rewrite it in my own words and post it on my blog. The basic construction is simple. Ready? One that sells wood, mind you. I used Redwood, cause I knew I would want the pieces to last and I didn't want to worry about having to stain or seal it. You can use whatever you like, long as the wood is relatively straight/flat. 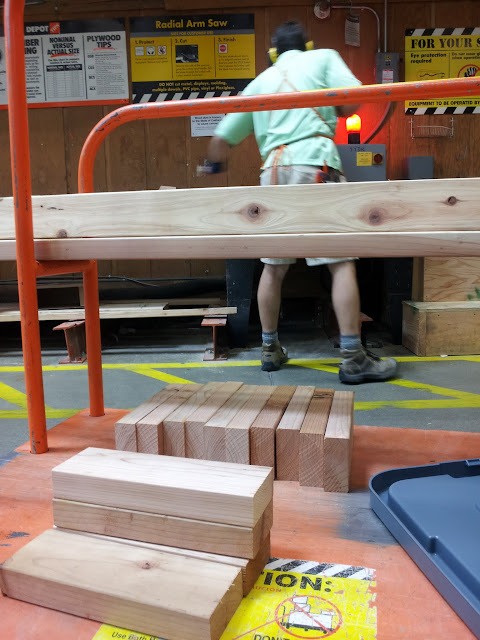 Most wood, say a 2x4, isn't actually 2 inches by 4 inches. (Did you know that? I didn't. It's kinda silly, isn't it?) So! You need to measure the ACTUAL width of the wood you want to use. This will be the length of your game pieces, as in this game, you stack a row of 3 pieces perpendicular to a row of 3 below it. This calculation will tell you how many pieces you can get out of each length of wood. It'll help you figure out how many pieces to buy. 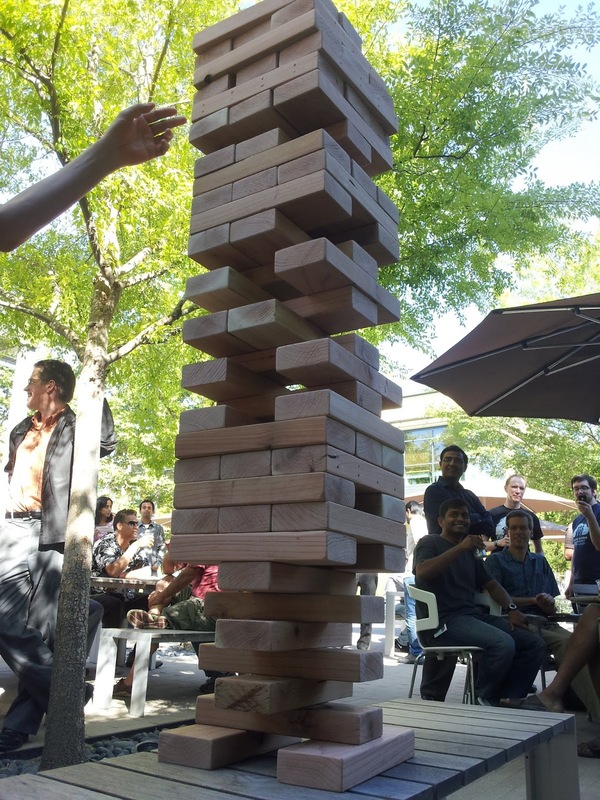 The table-sized tower game that everyone knows and loves has 54 pieces to it. My set has 63, as that's how much wood I had to buy to get 54 and I figured, why not make it bigger? Doesn't really matter how big your set is, long as the number of pieces is divisible by 3. Yeah, I think that step title kinda says it all... For me this was five 2x4x10 pieces. It'll make the pieces look nicer, and slightly less dangerous to the toes. I invested in a $20 power sander for this task, as the idea of sanding 63 blocks by hand was not pleasant. If you go this route, I recommend getting a cheap paper face mask and wearing goggles. Woo, saw dust.. 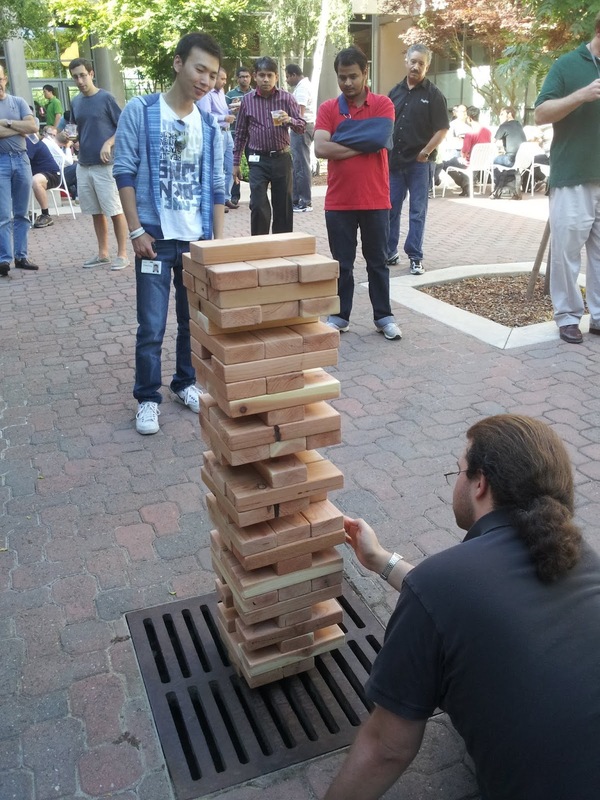 Step.. Something: Stack the Tower and Play! 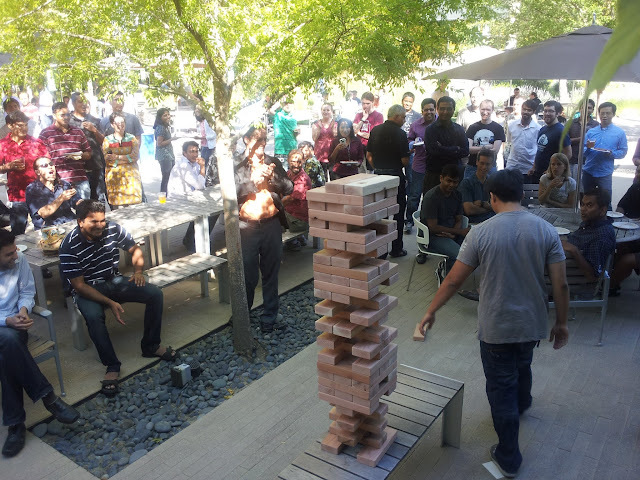 This game became a popular game at my office's Friday Parties. We draw a decent crowd whenever we play. When the tower reaches a certain height, you evoke applause from on lookers. It's definitely nerve racking when the tower is leaning over your head as you try to work a piece out from the bottom. Make sure you practice a bit before you bring it out in public. 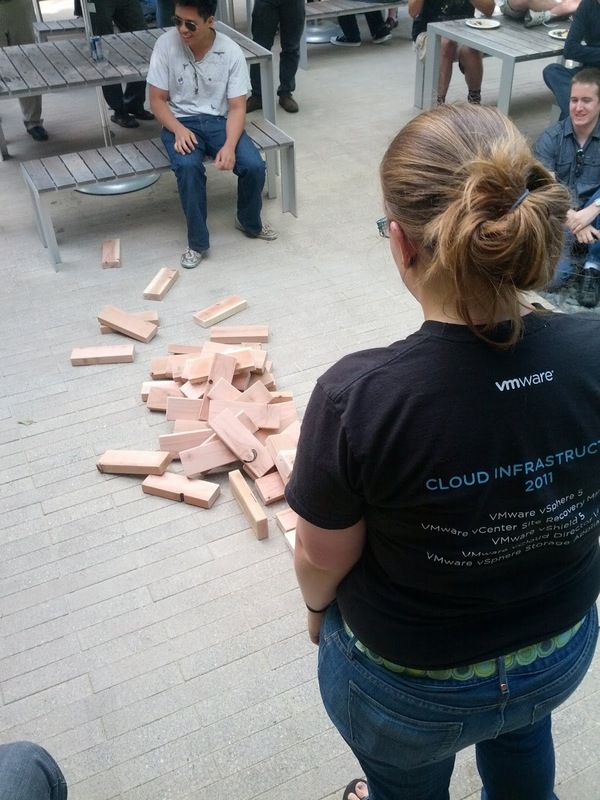 It's a bit sad when you're the one that loses the game you made..
Watch your toes when it falls!!! !